Last week, Nifty traded in the range of 11,500-11,700 and ended with a loss of 0.19 percent at 11,643. The Bank Nifty band was wide at 29,600 to 30,200, and it closed with a loss of 0.49 percent to 29,938. Pharma stocks like Lupin and Cipla gained over 5 percent each. The metal sector was underperformer as Vedanta, Sail and Jindal Steel were the top losers. Over the week, midcap stocks like PC Jeweller and Infibeam gained over 12 percent as a mix of short covering and longs was seen. NBFC stock like Ujjivan saw significant long of 6 percent with OI increase of 34 percent while reality stocks like DLF saw short getting added with the price down by 9.5 percent and OI up by 27 percent. 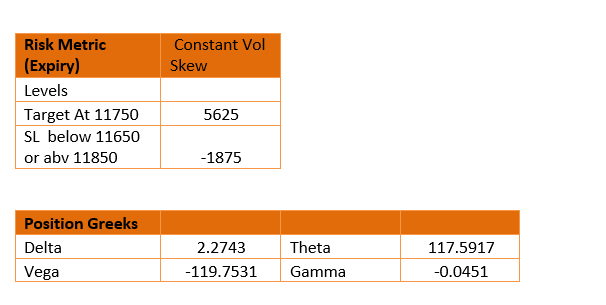 Future data of Indices depicts short in Bank Nifty whereas long unwinding was seen in Nifty for the week. With the onset of Q4 results, IT stocks were under limelight as pullback was seen both in TCS and Infy towards their important Put strike of 2,000 and 730, respectively. As results were announced after-closing on April 12, the impact could be witnessed on April 15. The Nifty options data saw monthly 11,500-11,600 Puts providing strong support and prices saw a rebound, higher end 11,800 now acts as an immediate vital resistance with Call OI of 2.2 mn shares. 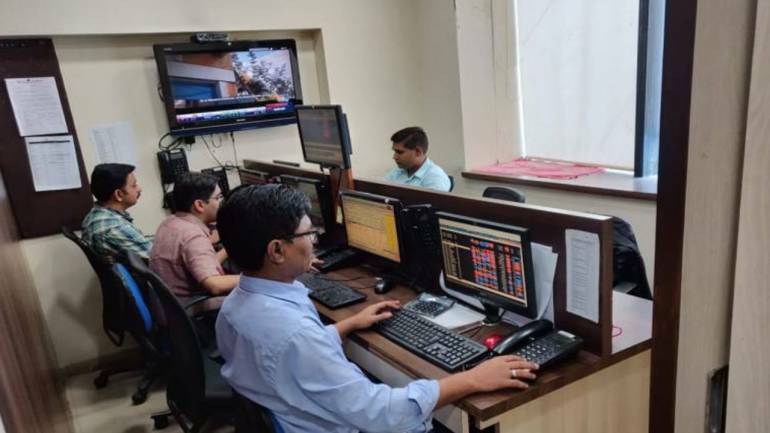 Weekly Nifty range gets narrower to 11,600-11,700 with an early indication of 11,700 Call writers squaring off seen at end of April 12 session. Considering coming week being truncated with only 3 working days, option writers were seen placing bets on either side to take advantage of the time decay. 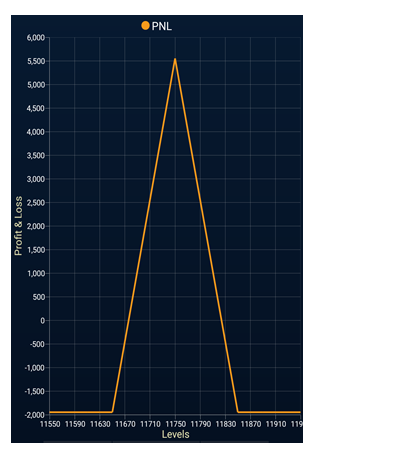 The Nifty PCR open interest wise stands at 1.54, keeping the room open for the upside. With Nifty future taking support near its gap area and Nifty spot prices forming multiple bottoms at 11,550 and reversing from lows reflect bull strength. Further placement of Put writers at 11,600 with an unwillingness to cover shows positive bias in the market. Thus bullish strategy is advisable. 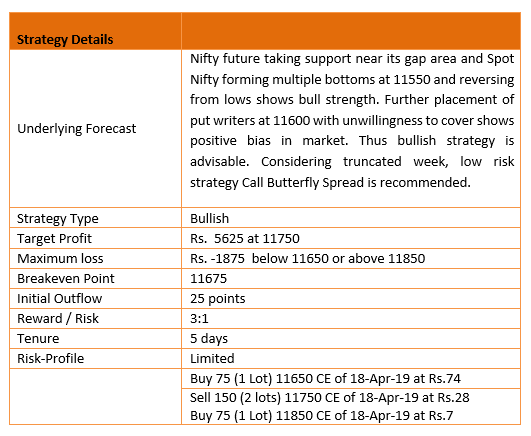 Considering truncated week, low-risk strategy Call Butterfly Spread is recommended. Call Butterfly Spread is bullish to rangebound strategy that offers decent risk-to-reward at low cost. In this strategy, we need to buy 1 ATM Call, sell 2 OTM Calls near the target level and Buy 1 further OTM call to hedge the risk.